Halt, Salute and...: Who is this horse and what has he done with Aero? 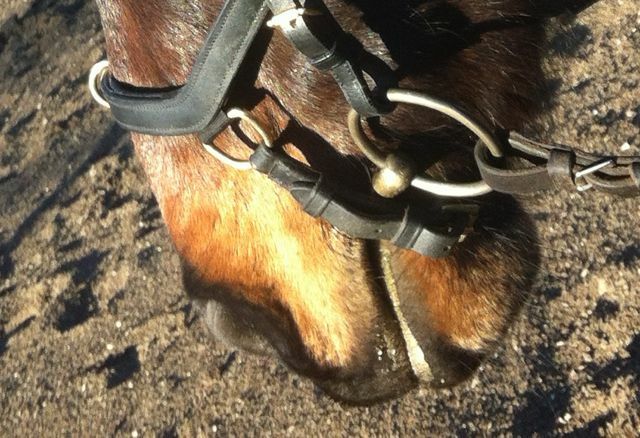 Who is this horse nuzzling the muzzle of the demonic-horse-eating-sometimes-invisible-killer-death-donkey-from-hell? What on earth happened? Suddenly, the Killer-Death-Donkey-From-Hell is not scary! 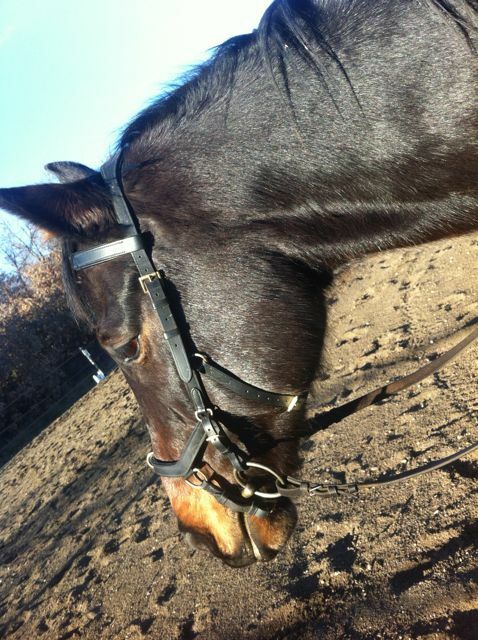 Today, Aero and I did about half an hour in the arena in walk, trot and canter. Initially, he spooked at some barrels at the side of the arena, but his spookiness felt different somehow - it didn't feel like I was sitting on an unexploded bomb, it just felt like he needed to check the barrels out before he could be sure it was safe to pass them, and once he'd had a look at them he was fine. After he decided that the barrels were ok, he was calm, sensible and a even little lazy in the arena.... quite a lot like Flurry, actually. Amazingly, I didn't feel like a beginner, struggling to cope with his big, bouncy trot - in fact I even did a couple of steps in sitting trot from time to time. Is he more supple in the back (and therefore easier to ride), or was he just pootling around in a teeny-weeny trot the whole time? A closer look at his "white lipstick!" I'm beginning to think the osteopath has a lot to do with this... or maybe, as Allison said on my last post, it's a combination of everything - he's settled more, he needed a break and the weather is nice and mild. Who knows! I kept the session short because I was so happy with him, but we practised leg-yielding in walk and did a few walk/canter transitions just for fun, as well as walk and trot circles & turns. This is more like the horse I've known and watched for the past thirteen years! Yay! I am so happy for both of you! I have found that after a few bad sessions, a nice, short, successful session seems to stick in Shy's head. Don't you just love it when they have foam on their lips at the end? It makes me grin and grin. All our horses freaked at the donkeys initially, but then they adapted. Although, Jackson does still enjoy chasing them around. Nice going! When they're good like that I like to reward them with a short session too. Good boy Aero! Those donkeys do have a way of getting to even to you:). I'm glad Aero is doing so well. Ooo, I'm jealous of your arena--since ours is buried under of foot of snow! This is the time of year I long for even a covered arena. It doesn't need sides, just a roof, then I'd be happy. It's hard to do the kind of work you did with Aero in all that snow, and I know Harley could benefit from it. Maybe in another 3 months--hah! I am so happy to have an arena at this place! I swore I wouldn't complain about it but maybe just this once..... it's on quite a slope and the footing is very uneven - deep and heavy in some places and just nice in others. Both horses struggle to keep a consistent rhythm in. Grumble over. It's better than having no arena!! 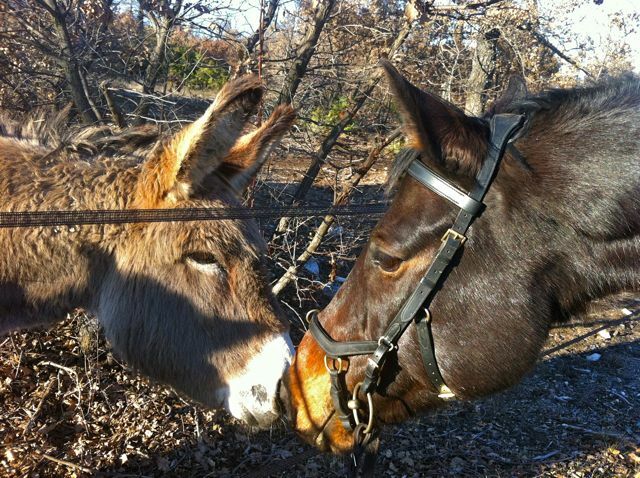 Love the picture of Aero nuzzling the donkey, hopefully he's over his fear!